Say 'goodbye' to those weeknight dinner boredom and 'hello' to this classic chicken parmigiana recipe. Imitate your favorite red sauce joint and bake this dish in under 30 minutes. Chicken breasts are coated in a mixture of seasoned breadcrumbs and Parmesan cheese for an extra-crispy coating and baked. 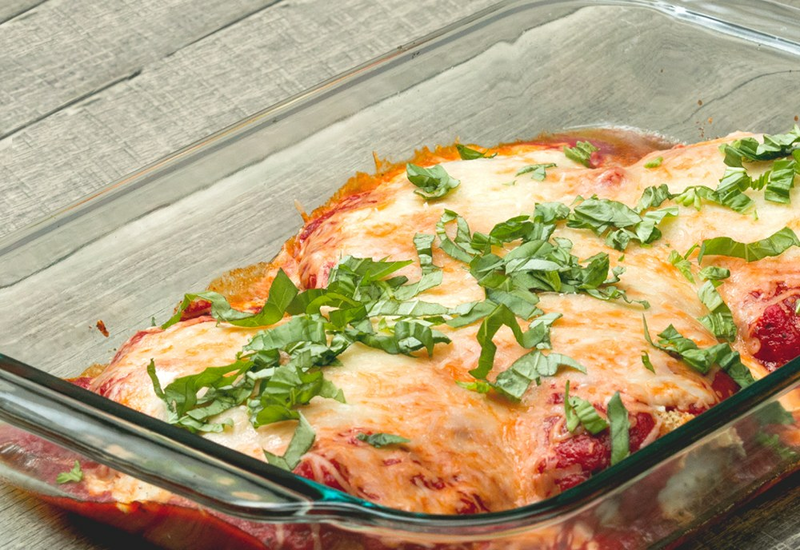 Prepared marinara sauce saves time, and the chicken is smothered with the seasoned tomato sauce and melted mozzarella cheese for an easy, kid-friendly weeknight dinner. Serve topped with shredded basil, and plenty of garlic bread to soak up the sauce! When compared to other cheese, Parmigiano-Reggiano is lower in fat and sodium and higher in vitamins and minerals. It contains 19 out of 21 amino acids the body needs, and a one ounce serving provides as much as 30 percent of a person's RDA for calcium. Per Serving: 1191 calories; 44g fat; 108.2g carbohydrates; 85g protein; 280mg cholesterol; 2490mg sodium. quick and easy - just how I like it! this dish was delicious and great for the lunch the next day. Mine turned out quite delicious! I followed the videos instructions more than the written ones (specifically how the chicken was coated) and cooked the chicken for a little longer than directed just in case. It came out quite tender and juicy! I also used spicy marinara (at my partner's behest) which added a nice accent to the dish. Overall it was fairly simple and worth a go! We made this recipe twice in one week! That's how good it is. Not only is it easy to make, but the ingredients are simple which I love! This is the perfect recipe for busy weeknights when you don't have a lot of time, but want something healthy. Solid recipe! It's very filling, and we used large chicken breasts so it easily fed our family of six. We did the double dredge / breading step twice, it was perfect! I always usually only do it once, so glad we repeated it for this recipe. This is really delicious for meal prep, but it's a little heavy for lunch. It's a great family meal that's hearty. I'd make this again for sure.